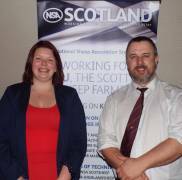 Following its Annual Regional Members' Meeting (ARMM) in mid-February, NSA Scottish Region has a new top table of officeholders - led by Jennifer (Jen) Craig of Crawford, South Lanarkshire. Jen is a hands-on hill farmer who has been on the regional committee for four years - ever since she first joined the NSA Next Generation Ambassador programme. In fact, beating a fellow Ambassador in NSA Northern region by just a few hours, she is the first NSA Next Generation Ambassador to become a regional chairman. John Fyall (pictured with Jen) completed his two-year term as regional chairman at the ARMM and has written an open letter to the membership in Scotland, to reflect on his term and comment on recent developments within NSA Scottish Region. Honda has donated one of its popular TRX 420FM1 all-terrain vehicles for a lucky sheep farmer to win at the Royal Highland Show 2019. NSA Scottish Region and participating NSA-affiliated sheep breed societies are selling raffle tickets at events and activities across Scotland, up to and including the Royal Highland Show, when one lucky winner will be selected at random on the final day of the show. Buy your ticket, for just £1, at agricultural events throughout Scotland. More details here.